Do you want to enjoy a new driving experience but don’t want to spend a lot? Then, you must resort to auto wreckers. 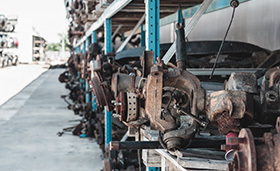 There are some companies with salvage yards where the old, junk, and worn-out cars are dismantled to strip off the car parts which are still functional. Then, these are recycled into new parts and sold at cheaper rates. We, at Dixie Salvage, can help. We are a full-service auto salvage company with more than 330 years of experience in this field. With our high-quality auto parts for all makes and models and extended warranties on all products, we are definitely one of the best choices that you have if you want to replace your car parts for a new and exciting experience. Right from engines, transmissions, to headlights, taillights, windshields, and so much more, we can offer you everything. So, if you belong to areas like Gainesville, Alachua County, Chiefland, Lake Butler FL, Live Oak FL, and Perry FL, you can resort to us immediately. Here, we have put together a few queries that you might have about buying these car parts from an auto wrecker. Take a look. 1. Are these auto parts the same as originals? These automotive parts are not exactly the same as you find from the original manufacturers but these function in the same way. So, if you are looking for a better driving experience, then you can trust these. 2. Can these be shipped to any part of the country? Well, this will depend on the company you have chosen for this purpose. Some companies offer nationwide shipping. But it is still better to ask the company in question. One of the most essential reasons why people prefer these auto parts is because these can provide the same functionality and yet are cheaper in price. So, you can save a lot by buying these products. If all your queries have been resolved and you want to go ahead with us, then quickly call us at 352-498-7000 or 800-226-7077 now.